This video recipe for brown butter perch features my first on-ice cooking demonstration, and if I could've woken up before 8 AM, it would have featured my first ice fishing demonstration. I've always felt that an alarm clocks' effectiveness has an inverse relationship to how nasty the weather is. I love perch. I love everything about them – the sweet, delicate flavor, the striking coloration, and the stubborn fight they put up for their size. So, when some friends of mine invited me out to their little slice of frozen heaven to ice fish for them, I jumped at the chance. I will resist the temptation to steal my own thunder, and explain in detail what you're going to see. In fact, I usually only do that when I need another paragraph to wrap around a third photo I really want to add. But, I will say that the recipe you're about to see can be easily recreated in your kitchen, and is perfect for those of you who continue to claim you can't cook fish. The key is getting the butter to a perfect nutty brown. Technically it's still butter, but something happens when it's toasted like this, and it really does become another ingredient altogether. Add some freshly-plucked-from-ice-water perch, and a little squeeze of lemon, and we're talking involuntary eye rolling. I'd like to thank my dear old friends, the Fitzpatrick's, for inviting me to their top secret perch hole(s), and for having such incredibly cute kids. I haven’t smiled this much editing a video in a long time. Enjoy! Bonus Coverage: Check out this great ice fishing post by my friend Tamar on Starving Off the Land! There is nothing in the world better than fresh caught fish. Summers on the Gulf of Mexico, my Uncle was a fisherman. Fresh caught Spanish Mackerel, hush puppies and beer. Hate to be that guy - but you got to kill those fish. I'm squirming watching that guy wriggle as he gets filleted. I conk them with a mallet, does it make it better? Probably not. Gives me peace of mind though. Agreed. That's a little too fresh for me. Let me congratulate you on your Super Bowl predictions! You have earned your lofty perch! You get big points for actually cooking those fish on the ice! And that is a super-groovy fileting technique. Thanks for the shout-out to my ice fishing adventures. Great video, nice to see a family together in the great outdoors enjoying each others company and having fun fishing rather then the typical family today more worried about texting and there jobs then the simple pleasures of life. 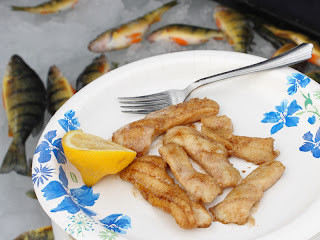 Great recipe aswell ive been doing perch this way since i was a kid and never miss a chance to get out on the lake with the ones i love. Great video Chef John! Nothing better than friends and family outdoors enjoying the best nature has to offer. BTW, browning the butter is my secret ingredient on popcorn. Everyone says my popcorn is the best ever. The nutty flavor is a huge flavor boost on popcorn. Never understood the whole thing with electric knives. Hauling a big battery out there when a sharpened filleting knife would do it faster and easier. About the fish killing thing. Fishes are always left to die. I guess these ones are lucky they get done with quick. Farm animals (at least proper farms) usually have it much sweeter than fishes in general. They get in most case swift deaths. Sweetest video ever! Hunter the ham is a real star! You'll have to take my word for it, but he takes after his father for that! we miss going to the finger lakes! my father in-law is from rochester, so when my husband and i were still living in the states, we would drive up to the lakes. such a gorgeous, gorgeous area! needless to say, we're getting nostalgic from your vid. Some smelt are soon to go into brown butter here. They are fresh and plentiful around here right now. While I do have one of those exact same stoves and it got me happily fed on a many a camping trip I think I will use the stove instead. Are you people really stupid? the wiggling of the tail comes from the motion of the electric blade. He's not slicing live fish. What a great family day away from the hussel&bussel enjoying the wondrous outdoors with fabulous family/friends PLUS the yummy tasty gifts of nature. Good thing the location is a secret or PETA might protest. I made this up today-hubby said it was the best fish he's every tasted. Awesome recipe! Thanks so much. Chef John, (PLEASE READ THIS). I know this post wont get approved, however I do hope u read this. That was cruel as hell filleting the fish alive like that. Thats just cruel and downright lazy. I know your not the one doing it but you really disappointing me. You still could have said to your friends hey, that's kinda cruel skinning those poor little guys alive why don't u kill them first. I am in no way a vegetarian or an animal activist. In fact Im a 35 year old country boy who hunts and fishes but I do have enough of a conscious to kill my food BEFORE I start cutting on it. The fish might be unintelligent by our standards but I bet it hurt like hell filleting him while he was slowly dying. I wouldn't wish that kinda death on anyone (not even obama probably). You and Alton Brown are my two hero's in the culinary world and I look up to you both. I told myself when I fist saw this video that I would never watch you again and maybe even start a blog about it. However, I do still like you I guess. I can almost understand that maybe you just figured it wasn't your place to tell them how to fillet their fish. You gotta take into account though that the poor fish cant scream or say please stop and kill me humanely so you still should have said hey, let me kill those fish for you before you fillet them. You could have used the excuse that your viewers may not like that. That way you wont look like a wimp in-front of your friends, you can blame it on your viewers. All im basically saying is that you have a great show and I feel it is your responsibility as a public figure to not let cruelty like that happen on your show. Other people look up to you may think its OK to fillet a fish alive since you did it. Instead I would prefer if you taught people to respect their food whether its alive or dead. If im a fish or some other animal and I am forced to give my life to feed someone else I would hope that that person eating me will at least give me a quick death without suffering.